After a long time of writing, my second book has been published! 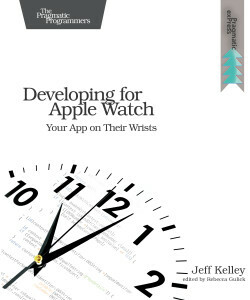 Developing for Apple Watch is now available from the Pragmatic Bookshelf in both paper and eBook formats! This is a “Pragmatic exPress” book, meaning it’s a shorter look at a specific technology. It’s also available on Amazon if you’d prefer it that way. The book introduces WatchKit, Apple’s technology for making Apple Watch apps. With 100% of its code in Swift, you’ll be ready to go with the latest Apple technology. Get it now and get a head start on making watch apps before WWDC!